Murakami Takashi, "Gero-Tan" "I express hopelessness." In the past several decades, Japanese popular culture has become inundated with a “cute” or kawaii aesthetic that is unique to the country. This imagery is present in media, advertising, and merchandise, and its appeal has expanded to overseas markets—the worldwide popularity of Hello Kitty being one of the best examples of this phenomenon. But when the bright colors, cartoon characters and whimsical subject matter began appearing in high art, it prompted a discussion as to why cuteness had developed such appeal and become so omnipresent. Japanese artists of the Superflat movement use the language of this pop culture iconography to explore what kawaii says about the Japanese people and their history. Takashi Murakami, founding member of the Superflat movement and author of its manifesto, views the development of kawaii as Japan’s response to World War II and the atomic bomb. When the Americans rewrote the Japanese constitution after World War II, they included a clause prohibiting Japan from using its army for anything but self-defense, and demanding that it remain a “peaceful state.” Some historians see Article 9 as a symbolic castration, forcing a policy of nonaggression and stripping the country of its right to express dissent through military action. In 2005, Murakami curated a show of Superflat art called “Little Boy,” also the codename for the bomb dropped on Hiroshima. The show’s catalogue directly faults Article 9 for the infantilism and willful innocence implied by the kawaii aesthetic, as it “forced the Japanese people into a mindset of dependency” and cast Japan in the role of a “child” obliged to follow America’s “adult guidance.” The New York Magazine review of the show notes that “Japanese pop represents the strange, even psychotic response of a population traumatized by World War II…from this vantage point, the firebombing of Tokyo evolved into the city stomp of Godzilla. The mushroom cloud became a pretty flower rising into the sky at the conclusion of a children’s TV show. Fantasies of power are irresistible to the impotent…” The sweetly naïve youthfulness of kawaii may well be attibuted to a sense of emasculation in Postwar Japan. The growth of kawaii corresponds to the growth of otaku culture in Japan, and both kawaii and otaku provide a means of escape. Otaku can become engrossed in anime, manga, or other hobbies, sometimes to the detriment of their ability to interact with the outside world. The world of kawaii is a fantastical one by nature; where loaves of bread talk, cats wear pinafores, and children frequently possess special powers. In “Plumbing the Depths of Superflatness,” Michael Darling cites anime legend Yoshinori Kanada as an inspiration for Murakami, and notes the escapist atmosphere of his work: “Kanada’s fanciful images of destruction serve to distance the viewer (and the creator) from the real horrors of war, and can be seen as a symptomatic retreat from an honest reckoning with the ravages of World War II and the bombing of Hiroshima and Nagasaki.” Murakami also filters confrontation with the war through a cartoonish lens, but is aware of the dynamic and deliberately plays with it, as in “Mushroom Bomb Pink.” Here the mushroom cloud has formed the shape of a skull with two big eyes, painted against a fluorescent pink background. Mushrooms recur in many of his pieces, as in “The Army of Mushrooms.” The connection between the image of the mushroom and the miliaristic reference of the title is impossible to ignore, but the implications are obscured by the anthropomorphization of the mushroom and the sunny, springlike palette. From an academic standpoint, Superflat art and the kawaii aesthetic it reappropriates is a means to examine many aspects of Japanese culture and self-perception. 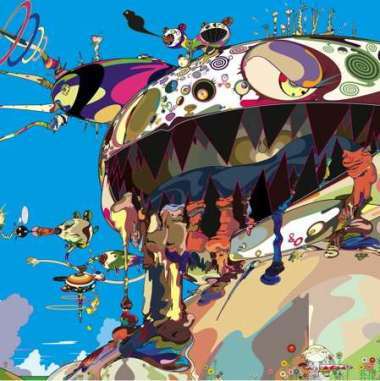 But forefront in the work of Takashi Murakami is a preoccupation with the past and how the Japanese choose to view and confront it. 1. Does Superflat art’s treatment of World War II help or hinder direct confrontation? 2. Does the irony of the Superflat style prevent it from having lasting impact? 3. American critics compare Murakami to Andy Warhol, but Murakami resists the comparison. Is there an aspect of Superflat art that Western audiences would have trouble interpreting? Darling, Michael. “Plumbing the Depths of Superflatness.” Art Journal 60.3 (2001): 77-89. JSTOR. Web. 8 Apr. 2010. Holmberg, Ryan. “Little Boy: the Arts of Japan’s Exploding Subculture.”Artforum International (2001). Stevens, Mark. “Toxic Cuteness.” New York Magazine, May 21, 2005. Great images in this post. Its interesting to see different opinions/research about the development of kawaii, everything I’ve found so far suggests that it arose from the natural tastes of young teenage girls and eventually caught on with the general public as a reaction to the shock of post-bubble life in Japan. I find your post-war perspective interesting though, particularly to think that the representation of cuteness may be Japan’s own way of making peace with their forced dependency on Japan….although I’m not quite convinced of that yet. IS Japan’s use of kawaii and love of superflat art an intentional representation at all? Or is it just capitalizing upon personal tastes taht arise form some other reason? Is post-war cuteness possibly a separate phenomenon from post-bubble cuteness? I don’t know about the irony being a distraction from superflats meaning, but the colors, cute images and busy designs certianly do distract the eye from many pieces’ messages. Great images in this post. Its interesting to see different opinions/research about the development of kawaii, everything I’ve found so far suggests that it arose from the natural tastes of young teenage girls and eventually caught on with the general public as a reaction to the shock of post-bubble life in Japan. I find your post-war perspective interesting though, particularly to think that the representation of cuteness may be Japan’s own way of making peace with their forced dependency on the US….although I’m not quite convinced of that yet. IS Japan’s use of kawaii and love of superflat art an intentional representation at all? Or is it just capitalizing upon personal tastes taht arise form some other reason? Is post-war cuteness possibly a separate phenomenon from post-bubble cuteness? I don’t know about the irony being a distraction from superflats meaning, but the colors, cute images and busy designs certianly do distract the eye from many pieces’ messages. I thought this article was really interesting, and the visuals really create perfect examples of what you describe in terms of Murakami’s postwar imagery. I think it might add to your post if you also included videos created by Murakami, either those we saw in class or others (I am not too familiar with his videos, so I don’t know how many are out there). I think an analysis of the animated explosions we see there could definitely add to this discussion, particularly because they seem to have a less direct link to war imagery but still maintain this theme. I think it might be useful also to go more into detail about how/ whether or not Murakami’s artwork distances the viewer from the subject. I was really intrigued by the discussion of whether or not this art enables Japan to “confront” the memory of the war. I apologize if this is a gross stereotype, but I have heard that Japanese society tends to shun confrontation, and I might wonder if this value of conformity over confrontation could be at play in the reading of superflat art. Finally, I think it might also be interesting to compare Superflat’s reception and interpretation in Japan to the reactions of the U.S. It seems ironic that the third part of the trilogy “Little Boy,” with such an obvious war reference, would be shown in New York. We have also talked a lot about the difference between the American and Japanese view/ viewership of animation, and I wonder how this gets played out in art critiques.